Do you have a custom furniture idea you’d like to turn into a reality for your home? 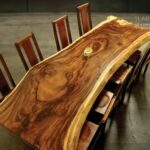 At David Alan Collection, we love creating uniquely tailored furniture out of beautiful materials for our customers. Whether it is a special finish on the slab of your dreams, a unique base for a coffee or dining table, a custom carving, or a newly designed piece, we welcome your proposals. We offer unique and rare materials for kitchen counters, headboards, wall treatments and so much more. We dedicate ourselves to every piece that comes out of our wood shop with time and attention to detail. If you are inspired by the custom pieces we have at David Alan Collection and would like to incorporate something special into your space, please get in touch with us or stop by the gallery anytime. Let’s talk about your design ideas and collaborate on how your concept could become a real piece of custom made furniture.